Most of the time I cannot differentiate my many emotions, certainly not enough to attribute one particular feeling with school. PhD Comics does an excellent job of telling like it is, rendering what I say useless and redundant. Nonetheless, I am committed to you, the McGill student body (and prospective students), to share this awkward and stressful time in my life. Today’s topic will be self-esteem, and to illustrate my point (pun intended) I have made a ‘self-esteem’ vs. ‘time’ graph. See Figure 1. *The dotted red line indicates level of self-esteem needed to be a respectable functioning human being. 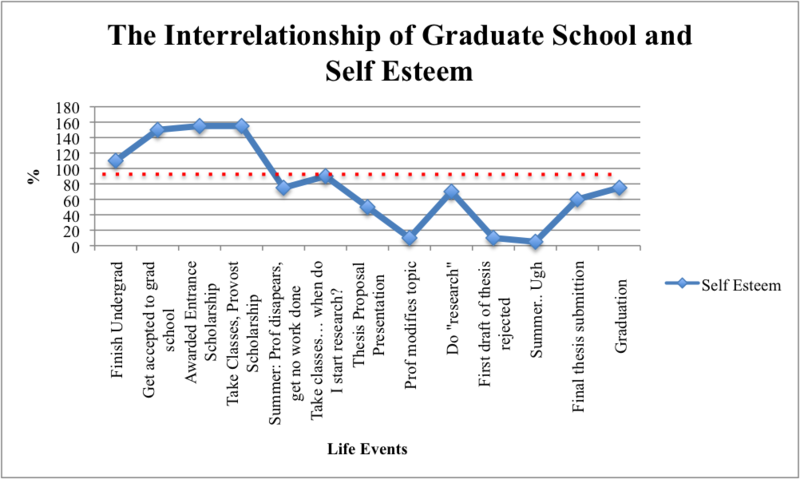 This graph was inspired by a friend who was helping me understand that, like life, grad school has a lot of ups and downs. Don’t be surprised if you finish graduate school a little uncertain, a little unsure, a little broke. I think we all feel or have felt that way sometime during this long academic road and the important thing to remember is to keep your chin up. And if you really can’t keep your chin up, just think about how lucky we all are to go to such a great school, or just school in general. No matter what happens with our degrees we are still enormously privileged. Although, that clearly has not prevented me from making fun of myself… OK enough with the rhetoric already. Get out there and crunch some numbers! Until next time, fellow Gradunauts. P.s. Please excuse the use of both “self-esteem” and the unhyphenated version “self esteem”, I am both hungry and indecisive. Published by Zsofia on 2012/03/31 at 8:43 PM under Grad school experience, Tricks, tips and recommendations.